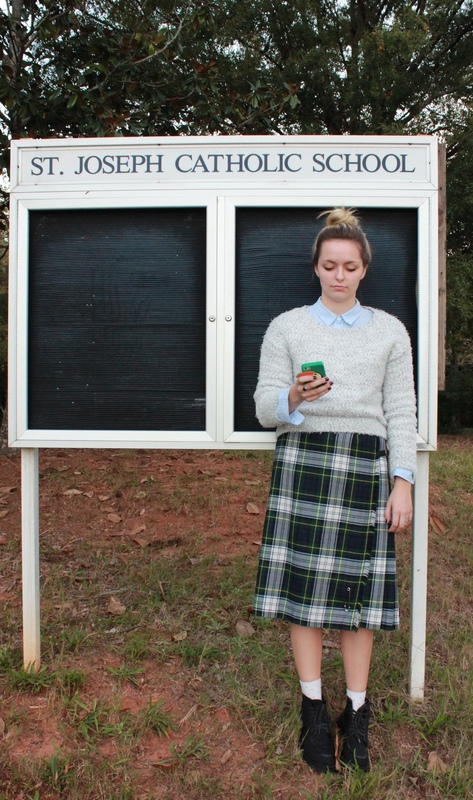 As you may know, I have recently decided to dye my hair yet again... but had not yet had time to post this fun ode to green-tinted bleached hair & creepy abandoned Catholic schools yet. The sinners are much more fun "
And also that only the grungy, photographically curious get confusedly confronted by grandpas who, while on their way to the still-apparently-functioning church next door, are surprised to find hoodlum college girls taking weird fashion pictures at the old school . "Did you go to school here?
. . . You can't go in there." "We got it, thanks Grandpa!" And finally, a reminder that the school girl look comes in many forms. & general social norms prevent me from feeling comfortable showing up to class like this. top-buttoned oxford, real Scottish kilt, and of course, my faithful men's Gucci combat boots for a pinch of punk. for maintaining a studious and organized aesthetic even while doodling in class. without being objectified or dumbed down by my peers and teachers. Have a lovely second Monday everyone. photos by Stay Fierce, of course.